Bodykits! If you need a way to instantly make your car look worse, a body kit is the answer. But wait. 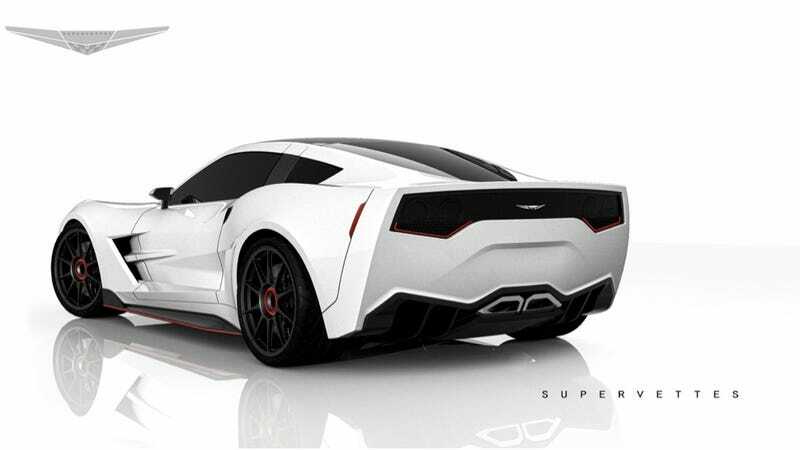 Here's a bodykit for the C6 Vette that doesn't totally blow. What the hell is happening? This is a kit called the Supervette SV8.R, and it looks pretty spectacular. It's like a concept version of a C7, all angles and Ferrari-esque lines. If Vette designers were even more daring with the C7, we might have gotten something like this. Of course, this isn't a $120 kit you get a Pep Boys. If you want to make your C6 into the SV8.R, you'll need to shell out $60,000. And that's $60,000 that could be put towards a C7. Of course, these are renderings right now. Hopefully the real deal also looks this good. So yeah, it just depends on personal preference, I guess. Though you do get round taillights with the Supervettes model, which will probably make some folks froth at the mouth with joy.